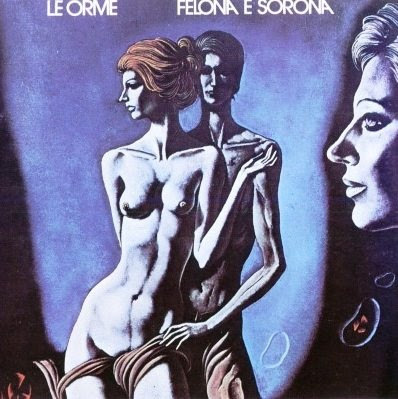 Felona e Sorona is an album by the Italian progressive rock band Le Orme. It was released in 1973. Usually ranked amongst the finest albums of 1970s progressive rock, it is a concept album pivoting on the story of two planets which revolve one around the other, without ever coming in contact. While Felona is shiny and flourishing, Sorona is dark and home to plagues and catastrophes: however, in the second part of the suite, the fate of the two planets is inverted. Apart from two acoustic interludes, the music is mainly keyboard- and synth-driven, producing gloomy and spacey effects, especially in the opening "Sospesi nell'incredibile" and in the famous instrumental ending piece, "Ritorno al nulla" ("Return to Naught"). A version with English lyrics by Van der Graaf Generator's Peter Hammill was issued in 1974. The English title is Felona and Sorona. Hammill now dissociates himself from this project. The titles of the English version are showed between brackets.